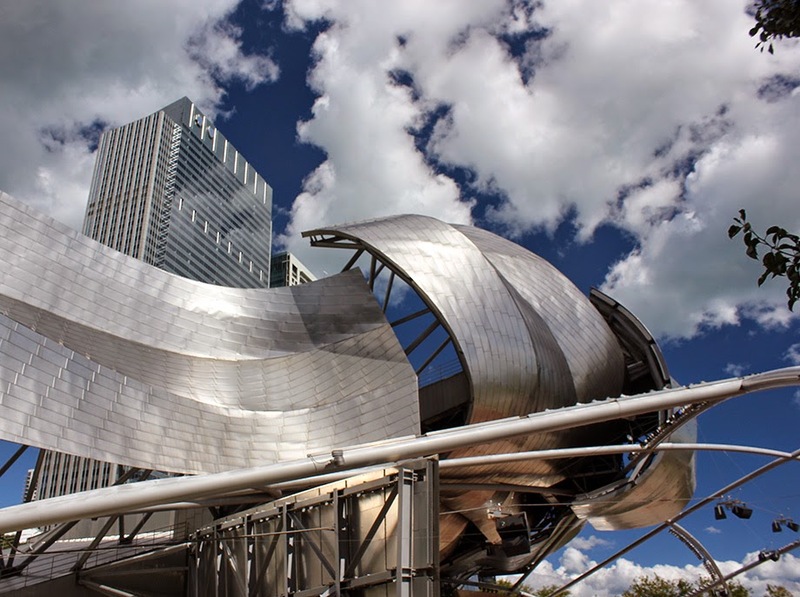 ArchitectureChicago PLUS: Gehry's Web - On its 10th Anniversary, How the visual music of Frank Gehry's Pritzker Pavilion binds together Millennium Park and the City around It. 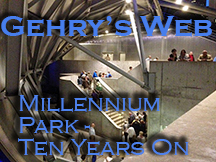 Gehry's Web - On its 10th Anniversary, How the visual music of Frank Gehry's Pritzker Pavilion binds together Millennium Park and the City around It. 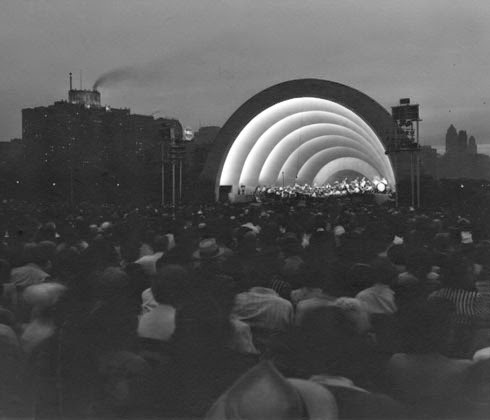 In the early 1930's, Chicago built a bandshell in Grant Park just north of the Field Museum. Its scalloped shape was a direct crib of the new Hollywood Bowl in Los Angeles. 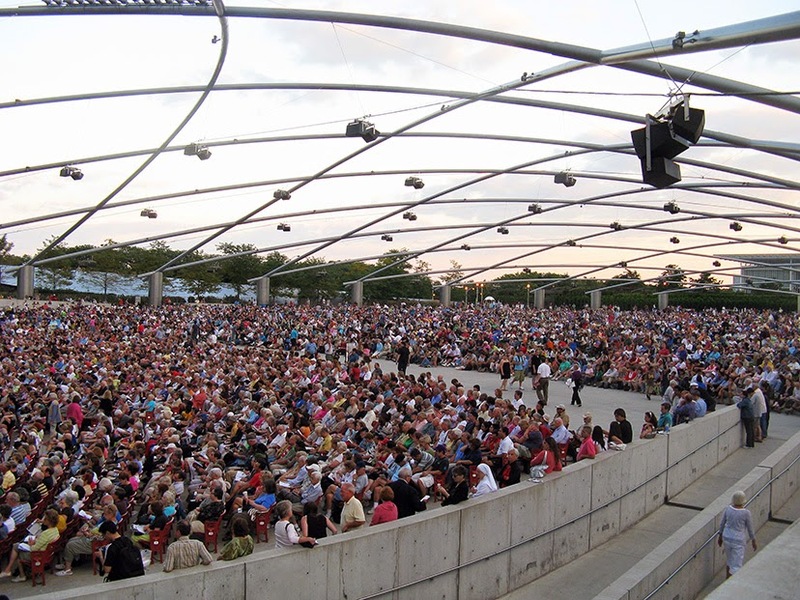 Unlike at The Bowl, set in nature, the curving form of the Grant Park bandshell was a visual counterpoint to the angularity of the skyscrapers in the background. The Grant Park concerts proved enormously popular, but the original “temporary” bandshell endured into the 1970's. As it literally began to fall apart, there were proposals for a new, more ambitious concert facility in Grant Park, including a spectacular design by Gene Summers that would have been constructed over the Monroe Street garage. 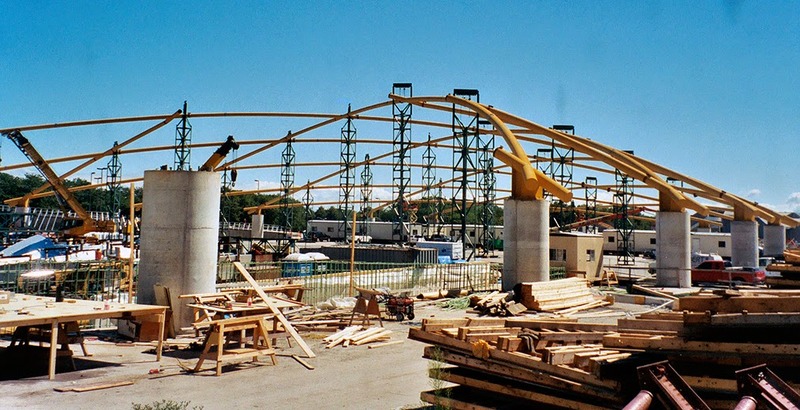 Advocates for an open Grant Park carried the day, however, and the depressingly desultory Petrillo Bandshell at Butler Field was the only thing to make its past the censorious protectors of the park. Another “temporary” facility, it would remain the home of Grant Park concerts for nearly three decades. It's no small miracle that we didn't wind up with something similarly underwhelming at Millennium Park. 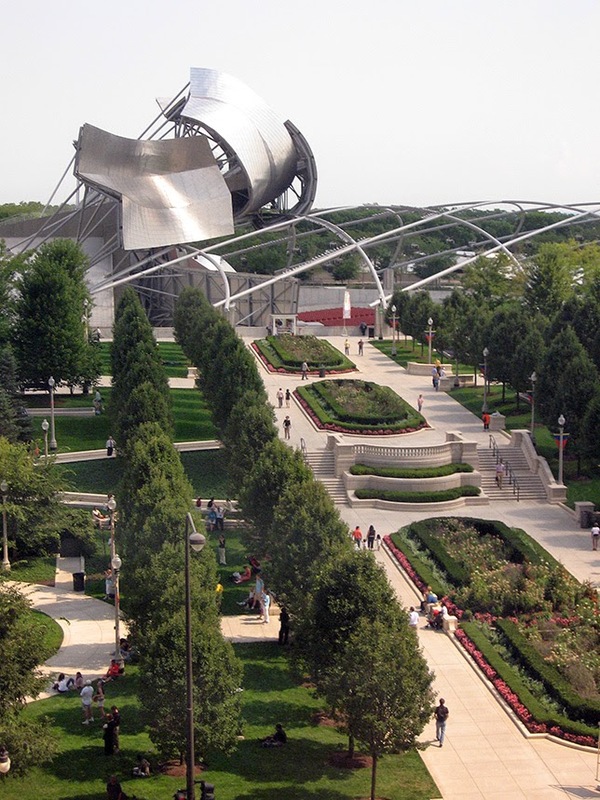 The master plan by Skidmore, Ownings and Merrill followed Chicago's accustomed Beaux Arts-styled park template, with a modest concert facility penci1led in near Randolph Street at the north end of the park. But in 1997, Chicago Mayor Richard M. Daley enlisted John Bryan, the CEO of Sara Lee and the city's most effective philanthropic rainmaker, to raise the $30 million in private sector funds that was what Daley thought would be needed to realize his dream of a new park replacing the decrepit north end of Grant Park and gaping ditch of railroad tracks next to it. Then all hell began to break loose. Bryan started to go all millennial, seeing the beginning of a new 1,000 years as the perfect opportunity to create a Chicago institution that would be worthy of such an epochal transition. Soon, in partnership with the Park District's Edward Uhlir, Bryan was dramatically upping the ante on the park's ambitions, and getting Chicago's philanthropic elite to buy into their vision. Key among them was heiress Cindy Pritzker, who hated, hated, hated the modest, traditional design proposed for the bandshell. 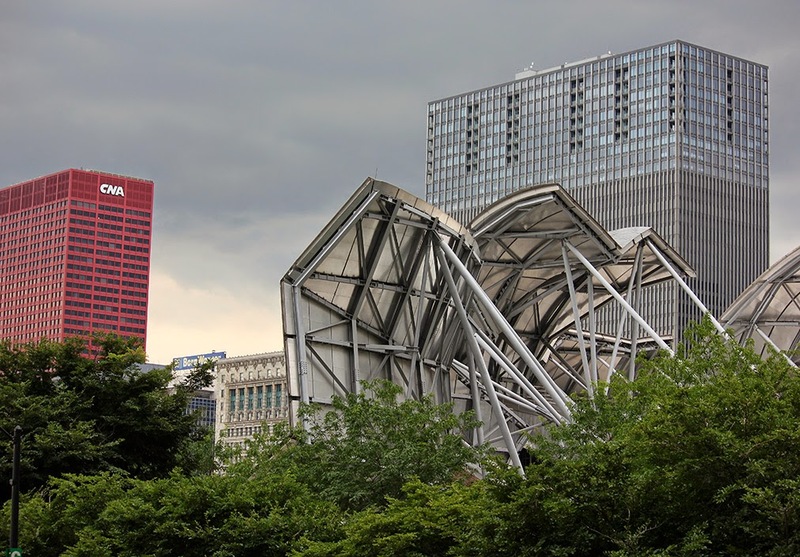 In 1999, it was announced that the Pritzker Foundation would be contributing $15 million for a new Millennium Park concert pavilion to be designed by Frank Gehry. Gehry's first attempt was a respectfully austere homage to the tradition of Mies van der Rohe “We started off with a very simply cover which was a very functional shed,” recalled Gehry partner Craig Webb. Gehry's Chicago patrons, however, were having none of it. 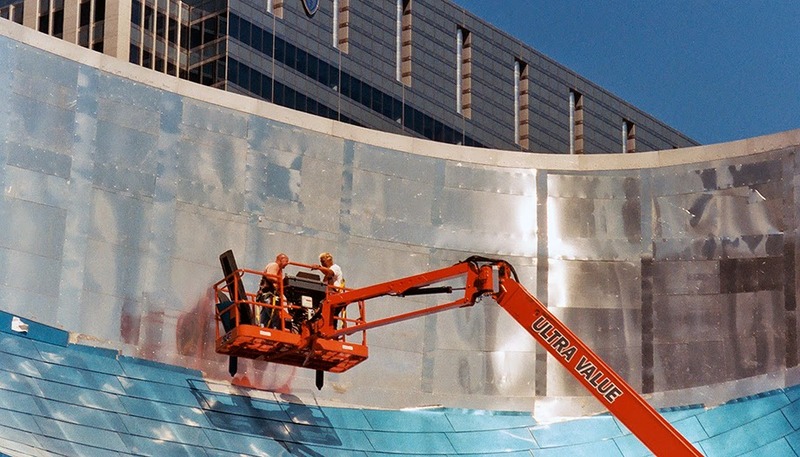 Just two years before, Gehry, pushing 70 and after decades of innovative work, had exploded onto the world architecture scene with the opening of his Techno-Baroque Guggenheim Museum in Bilbao, Spain. 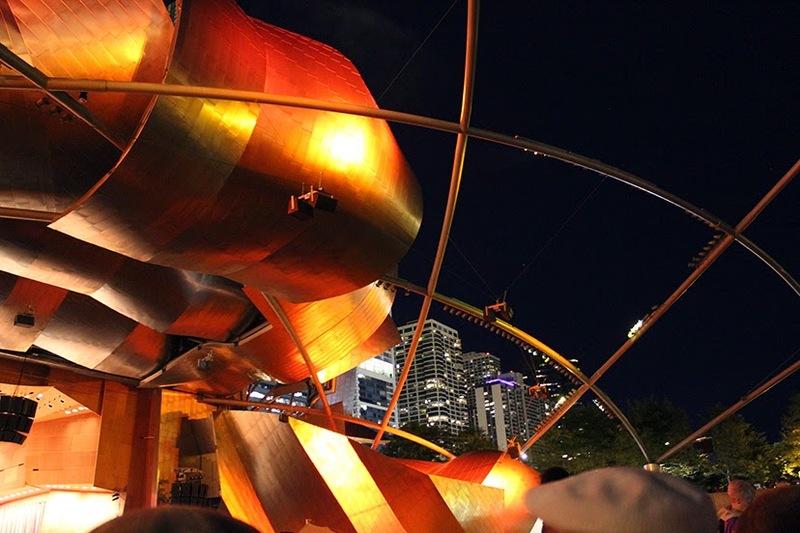 Chicago wanted its own version of Bilbao, and the Pritzker Pavilion was going to be it. The final cost would be somewhere north of $60 million. 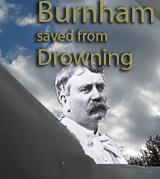 The design was not entirely new. In Los Angeles, Gehry had proposed a new design for the deteriorating Hollywood Bowl bandshell, in which billowing metallic forms would envelop the stage like MGM's Leo the Lion's mane. 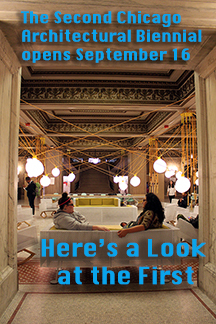 Transplanted to Chicago, the “mane” became “sails” or “ribbons” making up a “headdress” proscenium. Its epic sweep of cool, shiny titanium both envelopes and provides counterpoint to its soft, chewy center, the tall stage area faced in warm Douglas fir. 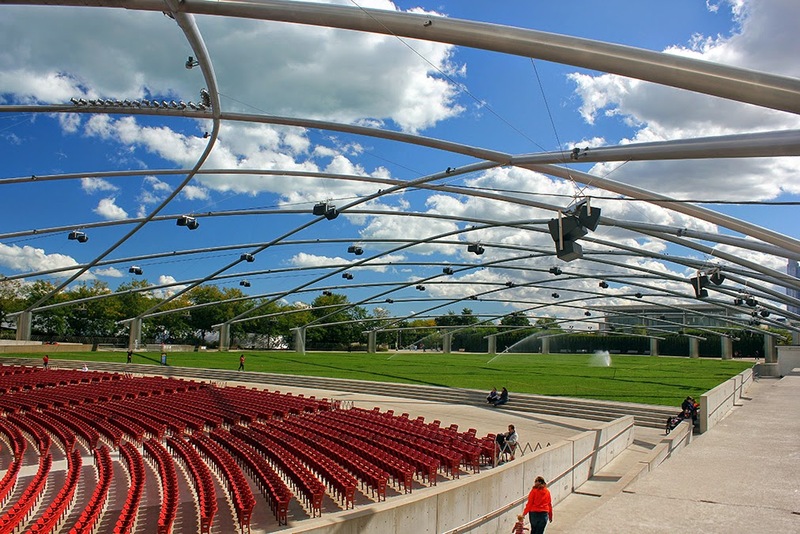 At the time Millennium Park opened ten years ago, Tribune architecture crtic Blair Kamin compared the Pritzker Pavilion to the follies - faux classical ruins - with which the wealthy decorated their estates. I talked about it as a non-functional “garnish.” Now I've come to see it as something much more. I had written how the bottom half of the proscenium was functional - pushing the sound out over the seats - while the top was purely decorative. In fact, that's how Uhlir and company got the thing past the height restrictions on buildings in the park. 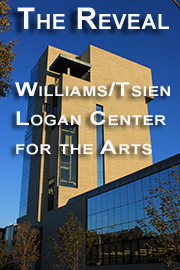 The proscenium was simply classified a sculpture to circumvent the ban. 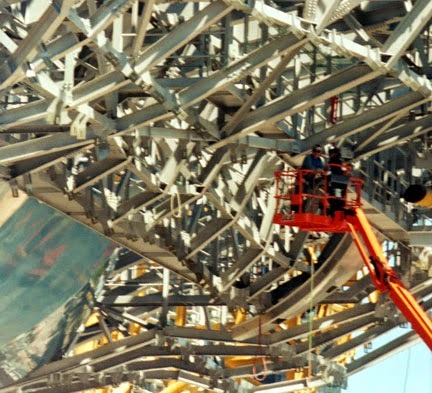 The design of the Pritzker Pavilion was Gehry's response to the monotony of the grid. A modern glass box skyscraper seems less of an expression of the energies of the people working within it, as a cage containing that energy. 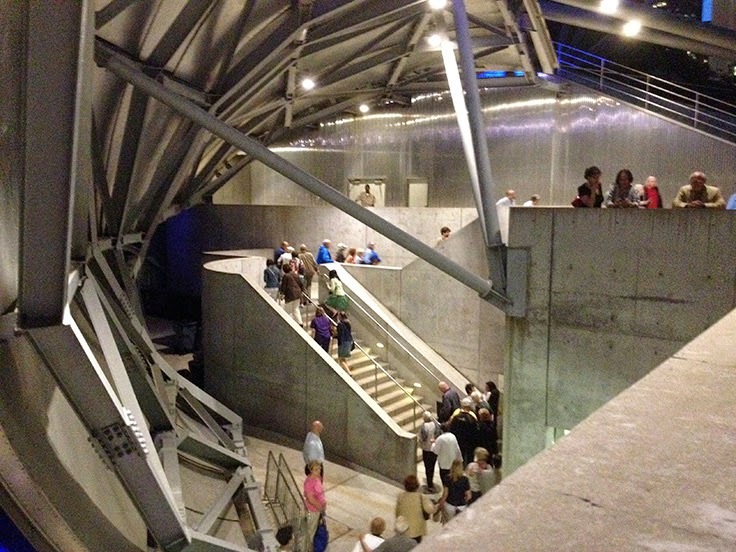 “That's how some modernism failed,” Gehry said in his book Gehry Talks. “when it started getting used by the developers, it became faceless . . . what was missing was human scale.” By breaking the Pritzker Pavilion into a maelstrom of swirling, interlocking forms, Gehry not only rebels against - and provides counterpoint to - the streetwall of modern skyscrapers along Randolph Street just to the north of the park, but the restless forms the the pavilion's proscenium appear to capture the energy of the music being made on stage and thrust it out into the park. The pavilion's back stair becomes a tour-de-force expression of falling into the belly of the great animal. 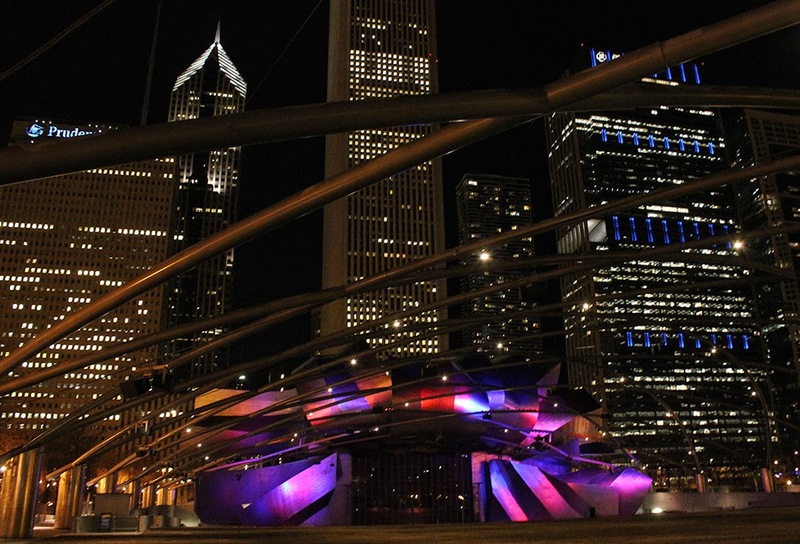 The Pritzker Pavilion is the visual anchor of Millennium Park. Wherever you are in the park, it's form is almost always lurking somewhere in your field of vision. While there's a second formal entrance to the park lining up with Madison Street, it just sort of peters out at the south end of the great lawn. 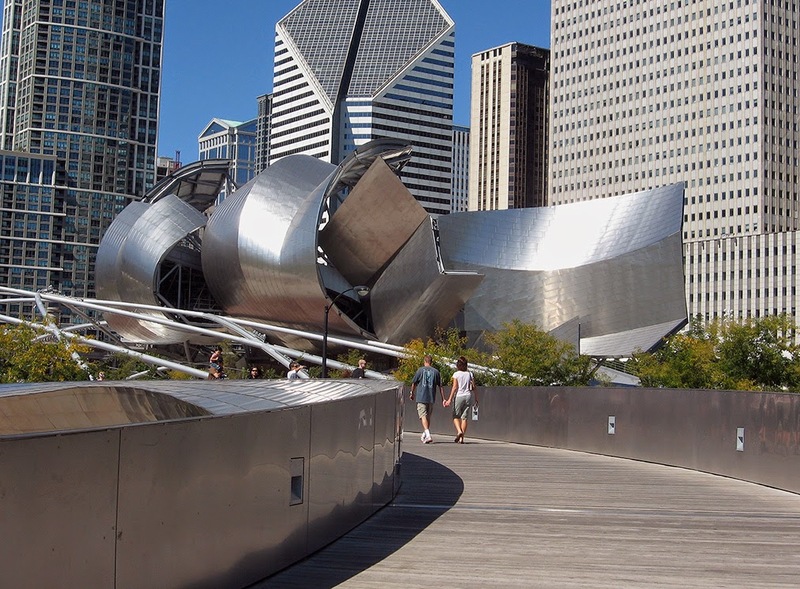 The great promenade to the north ends at the spectacular forms of the Pritzker Pavilion. Unlike the park's other two great attractions - Cloud Gate and Crown Fountain, which are located mid-block - the massive proscenium and its support structure conclude a vista directly down Washington Street that's a calling card for the wonders of the park visible all the way west through the Loop. 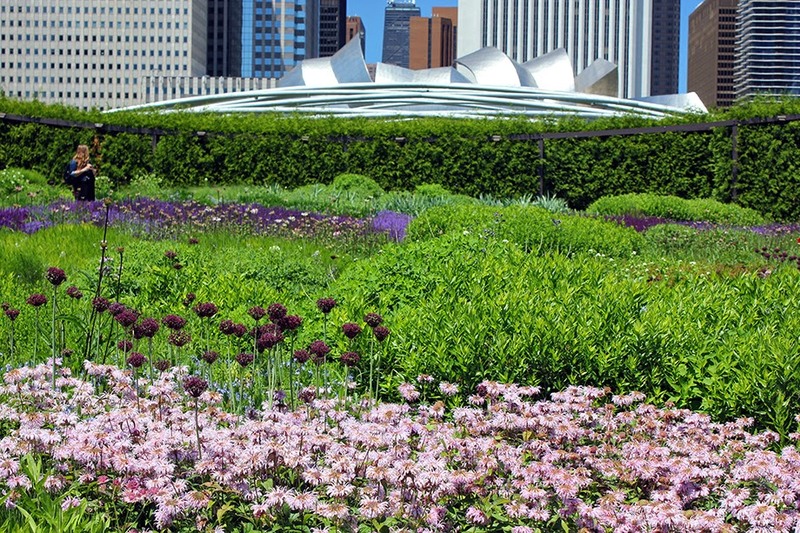 To the south, it seems to float about the flowers of Millennium Park's Lurie Garden . . .
And to the east, from the site of Michael van Valkenburgh's under-construction Maggie Daley park, it almost seems an extension of the Gehry-designed BP bridge . . . 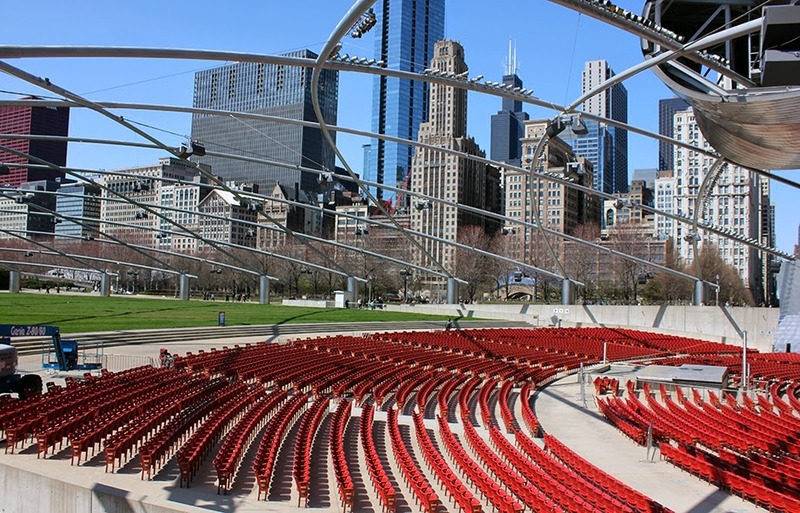 Even on the horizontal plane, the pavilion marks it territory as king of Millennium Park, both with the great swell of green lawn, and the almost endless sea of red seats that burn into the retina even in the the most frozen midst or winter. 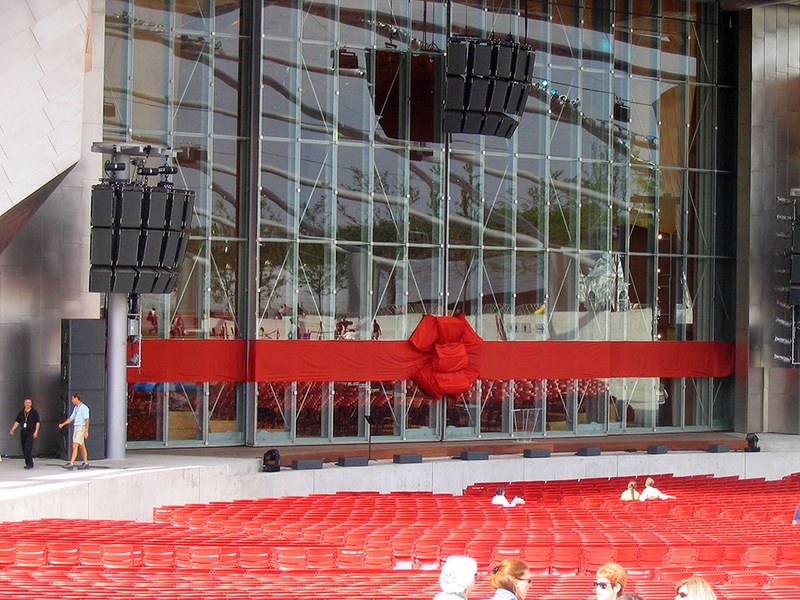 The stage, hibernating behind the massive glass doors, seems almost to breathe in its sleep, a rough beast waiting to be reborn. Instead, Gehry drew again on his Hollywood Bowl proposal, for a “distributed sound system” that could recreate a natural soundstage throughout the pavilion and lawn. Just as the speaker system defines an aural space, the spider's web structure of the trellis redefines a physical space, sprawling 600 feet from stage to back of the lawn, as a contained room, imparting an almost shocking sense of intimacy to what otherwise would appear to be bounded only by distant buildings and the sky. To underscore the illusion, the slender curving tubes of the trellis terminate in thick, tall metal anchors like shimmering exclamation points. The trellis not only defines the space in which the audience finds itself, but frames the city around it, most especially the Michigan Avenue streetwall to the east, a landmarked stretch of buildings including everything from the 1890's Chicago Cultural Center, to Art Deco 1920's setback skyscrapers to, in the distance, the tower of Adler and Sullivan's Auditorium Building, the fire-engine red steel-and glass CNA Building and cool blue notched tower of VOA's new Roosevelt University dorm. 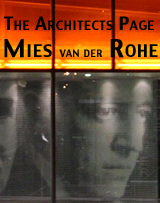 The infinite again becomes finite, the city a giant stained glass window leaded in the frame of the trellis. Much has been written about the interactive aspects of Millennium Park's two great art pieces - the 1,000 faces of the Jaume Plensa's Crown Fountain, and infinitely changing reflections of Anish Kapoor's Cloud Gate - of how, unlike the unmoving traditional sculptures carved in stone, they are always changing. 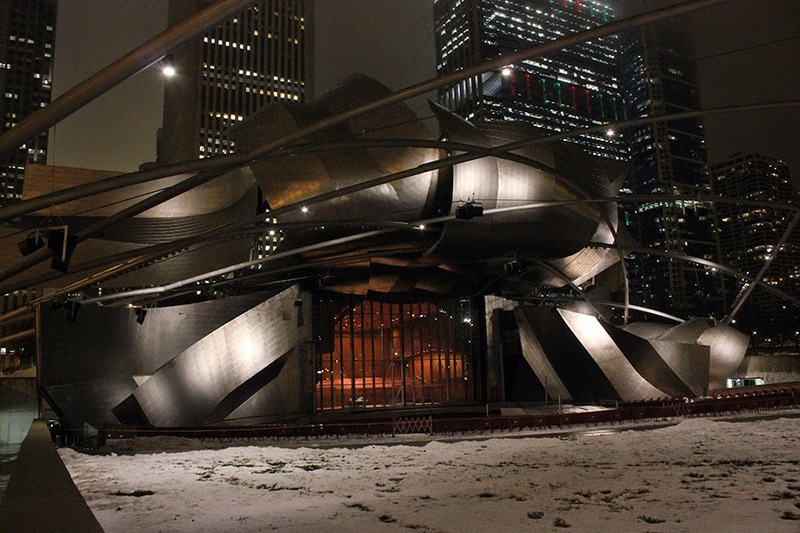 Strangely enough, however, it's Frank Gehry's Pritzker Pavilion that's the most dynamic of it all. Immobile itself, it radiates an energy of movement that sets the all-too-solid city around it to dance. Even with an empty stage, the emotions of its music sets ear and eye to delight. 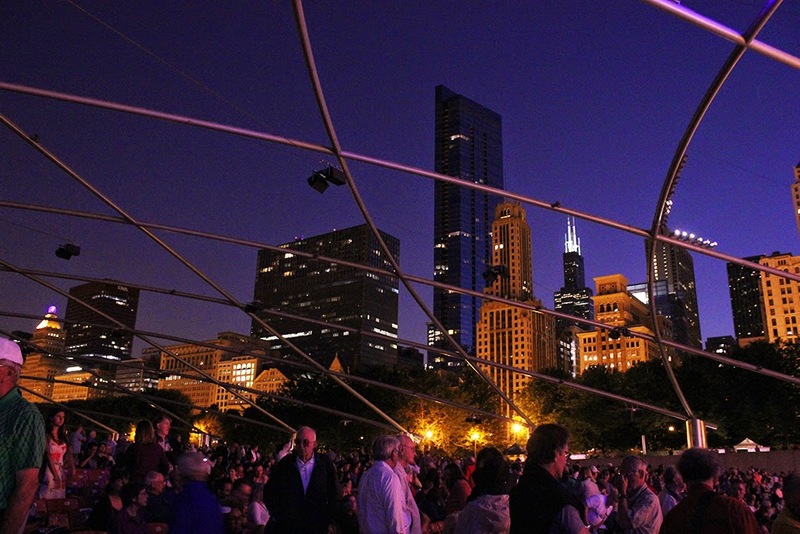 Flashback: From Millennium Park's Opening . 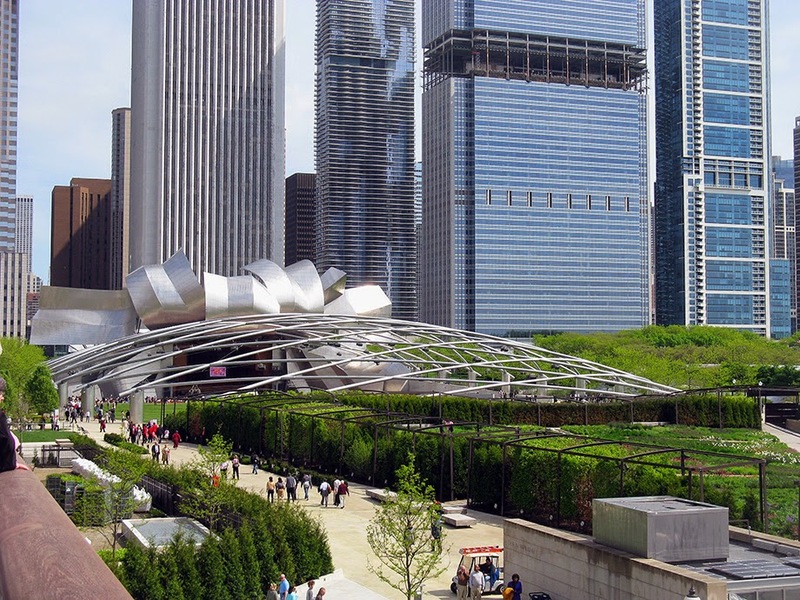 . .
"Forget the idea of calling Millennium Park Daley's Folly. Wealthy English, French and Italian landowners once built follies in the gardens on their estates. Now, in an exquisitely democratic twist, there are follies in the people's park. "Today, because its landscape isn't fully matured, these follies suffer from the stand-alone syndrome, coming awfully close to the theme park model of isolated objects, or pavilions, that hit you over the head with all the subtlety of a frying pan. 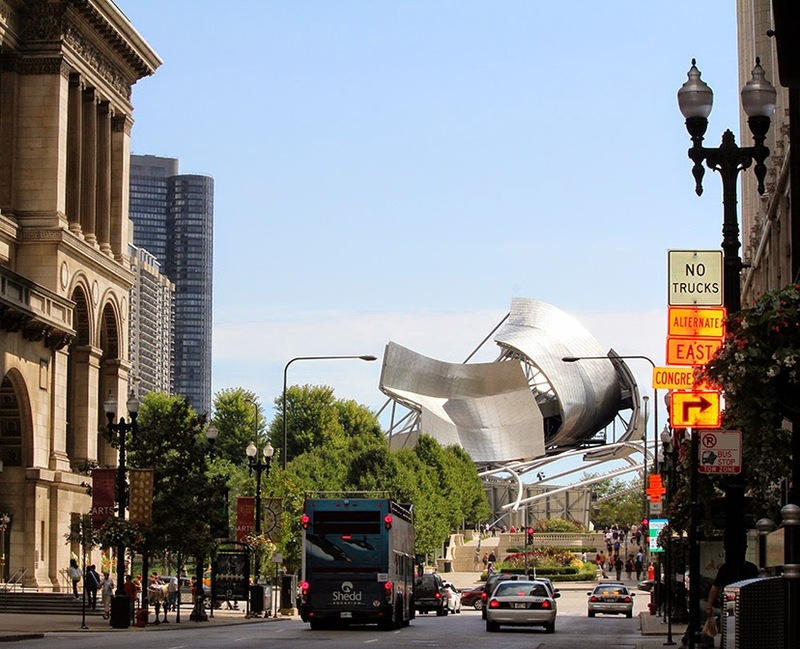 But once the landscape matures, as it has done in Wrigley Square, it should provide the subtle progression of vistas, pathways and discovery that distinguishes an artful park from an artless theme park. That is the reasonable prediction of Chicago's Terry Guen, who worked with Carol Yetkin, also of Chicago, to prepare the overall landscape plan. And the growth of the landscape to date backs her up." 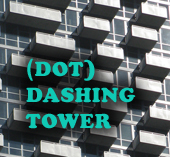 Thanks for the comment - you're one of the few people actually made it through the post - but nowhere do I claim you called the Pritzker Pavilion a folly. 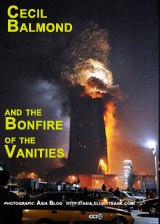 To quote: "Blair Kamin compared the Pritzker Pavilion to the follies" etc. Which is exactly what you did. In the second sentence of the paragraph you quote, you talk about the follies of European estates. In next sentence you say there are now such follies in Millennium Park" Back where I come from, that's called comparing. Nowhere in these paragraphs -other than the reference to Wrigley Square do you name the specific attractions you consider follies. 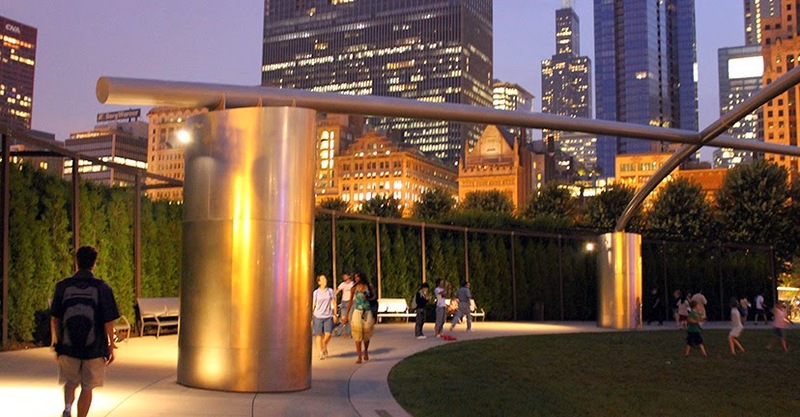 In fact, you refer to "isolated objects, or pavilions .. ." which makes it reasonable suppose you were referring to the only Millennium Park that is specifically called a Pavilion, ie., the Pritzker Pavilion. So thanks for clearing that up. However, I would definitely call the pavilion a "folly" in the sense that a great part of what makes the Pritzker distinctive are those great swirls, which for the most part are completely non-utilitarian and picturesque. Not that there's anything wrong with that.